It has been a pretty sociable weekend, between a visit from good buddy (and regular F&C contributor) Richard Wile, and the Midlands Woodworking Show in Newark. Friday morning found Rich and myself getting a very early start to drive to Newark in order to set up before doors opened. The Newark show is not one I’ve done before, so wasn’t quite sure what to expect. While much of the focus is on power tools and turning demonstrations, Classic Hand Tools had established a large hand work section and I was very pleased to find my pitch between Oliver Sparks and Lie-Nielsen, and opposite Skelton Saws. That is a good neighbourhood. For me, these shows are all about getting to catch up with good friends, meet new people, and enter into a wide conversation about woodwork. The power tool element of the show did give me an opportunity to look at the new Laguna 14BX band saw (a very impressive machine), but the defining aspect of the show was definitely the company we kept for the two days. At times when my stand was quieter I was able to pitch in with demonstrations at the Lie-Nielsen stand with Curtis Turner, and also caught up with Derek Jones (of F&C) and Anarchist’s Tool Chest classmate Matt Estlea, not to mention some long time readers of the blog. There were of course some excellent hand tools to try. Ollie Sparks always has something interesting (and enticing) to see, and this show was no exception. His “egg” thumb planes are not only striking but also highly functional and I can see these being a welcome alternative to the traditional luthier’s thumb planes, especially as he plans to offer a curved bottom variant. The other highlight was taking the Skelton Saws new Chippendale dovetail saw for a test drive. Now, I fully recognise that daddy has a saw problem but hot damn if that saw is not something else entirely. Shane has combined some seriously clever engineering with his customarily astonishing fit and finish, to create a truly special saw. I didn’t order one, but resisting that level of temptation is no mean feat. It also turns out that Newark has excellent Nepalese food, and the camaraderie continued on Friday night with an fantastic meal with the Classic Hand Tools crew, as well as post-show beer with Ollie Sparks and Molly. So all in all, two days spent talking woodwork and spending time with good friends, makes for a good weekend. It also yielded some new opportunities, which I’ll be writing about very soon. Thanks to Classic Hand Tools for the invitation to join them at the show, and to everyone who stopped by to say hello and talk handwork. The following is based on an article originally published in issue 276 of Furniture & Cabinetmaking. Richard Arnold has just annonced that this year’s open house event will be taking place on 8 June – I will be there (with Dr Moss and the Apprentice). Hopefully I will see some of you there! Every summer in the ancient market town of Market Harborough, Leicestershire, celebrated joiner and furniture maker Richard Arnold holds an open house event. The format is very simple. At the open house, Richard and plane maker Ollie Sparks (whose workshop is a few doors down from Richard’s) open their doors and welcome the public as well as likeminded makers and retailers. A charity auction of tools offers the opportunity to add some interesting pieces to your tool collection while supporting a good cause. The end result is a convivial and relaxed day of friends and makers coming together to talk woodwork and browse the treasure trove of Richard’s antique plane collection, as well as the wonders of Ollie Sparks’ workshop, all while fund raising for Macmillan Cancer Support. As a keen collector of eighteenth-century wooden planes, Richard found that he was buying large lots at auction just to acquire a specific plane within the lot. As a result, he was building up a large inventory of surplus planes which didn’t fit within his collection. Instead of trying to sell the planes on, he decided to open his workshop for a day and let people pick through the unwanted planes in return for donations to charity. Macmillan was identified as the charity of choice from the beginning, and so began an annual tradition. Over the years, the open house has grown in scope. As word seeped out that something very special was happening, the event rapidly became a highlight of the woodworking calendar as makers benefitted both from Richard’s knowledge of historic tools and from the strong sense of community engendered at the open house. I first heard about the open house back in 2016 when Richard Maguire mentioned it on his blog (www.theenglishwoodworker.com), and my interest was piqued. Events had conspired against my several on several years, but this year on 9th June I finally made the journey to picturesque Market Harborough. Enduring the predictable M6 gridlock was well worth it – both Richard and Ollie’s workshops were buzzing with plenty of familiar faces and animated discussion of woodwork, tools, and historic trades. Joining Richard and Ollie were Skelton Saws, Classic Hand Tools, Bill Carter, and Mac Timbers (who I am happy to report are once again back in business after previously closing down in 2015). Entering Richard’s workshop, I was greeted with a stunning collection of vintage planes, including many 18th century wooden planes. Not only does Richard collect vintage planes, but he also makes beautiful reproductions of some of them, and seeing modern and vintage versions of the same tool side by side is a wonderful experience. When I was able to tear myself away from Richard’s tool collection (a feat which took real determination), I found plane maker Bill Carter and many of his beautiful planes, including several made from the brass backs of vintage saws: a signature style of Bill’s. As an added bonus, on display this year was a Welsh Stick chair made in 1992 by celebrated chairmaker John Brown. If Richard’s workshop is a study in wooden planes and vintage ephemera, then Ollie Sparks’ workshop is the work of a genius mad scientist. As well as a display of many of his completed planes, Ollie also had prototypes on display as well as his design and sketch books. One particular highlight was Ollie’s new Kimberly Patent Plane, which features a patinated phosphor bronze escapement fitted to a Macassar ebony body. As well answering questions on tool making and hand planes, Ollie also demonstrated his metal casting techniques. If that wasn’t enough, Skelton Saws were also set up in Ollie’s workshop. It is always a pleasure to see Shane and Jacqui Skelton, and marvel at the beautiful saws Shane makes. The open house was no exception, especially as Shane had examples of his new Mallard saw (named after the Mallard steam locomotive, which had a significant influence on the appearance of the saw) and reproductions of some of the saws from the Seaton Tool Chest. The auction this year extended to 37 lots comprising a wondrous variety of tools (both vintage and modern), classes, books, and timber, all donated by supporters and tool makers. The generosity displayed by the donated auction lots, and the level of bids made in the auction, really emphasised the strength of community and also showed the profile of the open house – as well as bids from attendees, supporters from across the globe were also allowed to submit bids electronically. Some of the highlights of the auction included tools by highly sought-after boutique makers including Ollie Sparks, Philly Planes, Skelton Saws, Bill Carter and Jeremiah Wilding, along with classes with the London School of Furniture Making, and Derek Jones. The auction was presided over by the inimitable Jim Hendricks, whose fledgling tool museum in Kent is gaining a lot of attention (stay tuned for news of the grand opening in the hopefully not too distant future!). The auction, and seeing the workshops, was wonderful. But what made the open house a truly special event was the sense of community. Catching up with many friends from previous classes and events, and becoming acquainted with like-minded woodworkers, can be a challenge in what can be a solitary trade or hobby. Events like the open house offer an important reminder of why it’s so vital to make time to connections with the wider maker community. I left Richard’s workshop feeling invigorated and inspired as much by conversations with skilled craftspeople as by seeing the products of their crafts. Richard’s annual open house is a real highlight of the woodworking calendar – an opportunity to meet likeminded woodworkers, spend time in professional joinery and tool making workshops, and raise money for an excellent cause. This year between the auction and cash donations over £7,100 was raised for Macmillan Cancer Support. The open house will be a permanent fixture on my calendar, and I hope to see many of you there in future years. Issue 276 of Furniture & Cabinetmaking is now on sale, and features my account of the 2018 Open House hosted by Richard Arnold and Oliver Sparks to raise funds for Macmillan Cancer Support. The Open House was an inspirational and community centred event, and will be a firm fixture on my calendar going forwards. If you use an RSS feed to read OtW, or if you read via an email subscription, then you may not have seen the recent changes to the site. Over the Wireless started over four years ago as a way to simply describe what I was doing at my workbench, without any real expectation that anyone would want to read it. Now, with regular articles published in Furniture & Cabinetmaking and Popular Woodworking, the John Brown book for Lost Art Press, interest in commissions from prospective clients, and frequent enquiries about teaching classes (and more on this development very soon) I decided it was high time for an update of the site to better reflect the professional direction OtW has taken. My Legal & Disclosure information. The aim with the new site is to give a clearer picture of what OtW is about, to present the important information clearly, and to properly showcase some of my work. A website, very much like a tool chest, is never truly finished. But I think that this iteration of Over the Wirless is a significant improvement, and puts the site on a good footing to explore and develop the new opportunities and adventures that keep presenting themselves. Despite the fact that a large part of what I do here is communicating, I find it absolutely excruciating to write about myself. So when my good friend Jim McConnell announced his new venture (with wife Emily) as Wishbone & Hearth offering a writing, editorial, and transcription service, I knew exactly who to commission writing the new About page for OtW. Jim is an excellent writer (if you haven’t already, you should subscribe to the Daily Skep, and read Jim’s article in issue three of Mortise & Tenon) but most of all I knew I could rely on Jim to present who (and what) Over the Wireless is in a sympathetic and accurate light. After exchanging a couple of emails about the scope of the copy, and providing Jim with some background information, it was a case of waiting a couple of days for the first draft to arrive. The difference beween that first draft and the final copy you can see on the site is very slight, with only a couple of changes to tidy up and clarify some points. What I hadn’t anticipated was that Jim’s enquiring mind would pull together threads I sometimes overlook and draw them together to give a much better representation of Over the Wireless than I could have hoped to do myself. All this, with cutting through the myriad tangents and facets which occurred to me, but which did not add to the OtW message or narrative. Sometimes it takes someone with a bit of distance and perspective to capture what is truly important about your work – I’ve certainly found this with both the OtW branding designed by Tom, and now the copy written by Wishbone & Hearth. And working with other designers and craftspeople is an embodiment of the community spirit and engagement I really want to place at the heart of what OtW is about. Returning to Wishbone & Hearth in particular, Jim is a consumate professional (and very reasonably priced) and I would have absolutely no hesitation in commissioning further writing from him if the need arose. So, if you need someone to draft, edit, or transcribe recordings, then Wishbone & Hearth come highly recommended. Woodwork shows are a strange thing when you’re an exhibitor – the months of build up and anticipation which feel like they may never end, the show itself then disappears in a blur of faces, talk about woodcraft, old friends reunited and new friendships forged. And then the bittersweetness of breaking down your stand at the end of the show, amongst fond farewells. All this was all the more so given that EWS 2017 was the final European Woodwork Show (although Classic Hand Tools have said that they may be planning a series of smaller shows going forwards). This was my second time a EWS, and the show itself was fantastic. The breadth of exhibits was astounding, and a family atmosphere pervaded Cressing Temple, with something guaranteed to appeal to visitors of all ages (the Apprentice particularly enjoyed the heavy horse as well as the chainsaw carving). Vic is a good buddy, and a hilarious neighbour to have at a show like this. Never a dull moment, honestly. My stand this year was between Derek Jones and Vic Tesolin (I know, a tough neigbourhood), which ensured plenty of banter and hilarity throughout the course of the weekend. Curtis Turner from the Lie-Nielsen team – he and I first met at Handworks after severa years of chatting via Instagram. I interviewed Thomas Lie Nielsen for the John Brown book a couple of months ago, but this was the first opportunity we’d had to chat in person. Although I didn’t have much chance to stray away from my stand for long, it was great to catch up with so many friends who I only ever seem to see at woodwork shows, and to meet Instagramers, and readers. Thank you to everyone who took the time to stop by my stand and say hello, and talk about lutherie, furniture making, the John Brown book, and of course the Bad Axe Luthier’s Saw. As promised, I had plenty of spare fretboards on hand and it was great to see people with no experience in lutherie trying their hand at slotting a fretboard. Mark Harrell and I also gave presentations on the luthier’s saw both days – I managed to get these recorded so will upload one of them to the blog as soon as I’ve had chance to check the recordings over. With Mark Harrell and Susie Chillcott – the three of us worked on the R&D for the Luthier’s Saw for three years. When you combine good friends and musical instruments, it is never long until you find youself in the middle of a jam session. One of the highlights of the weekend was Sunday morning, when Anne revealed she had bought a mandolin with her. Without a second thought, we opened the show with an impromtu hour long jam session, running through bluegrass standards, as well as some alt country deep cuts by Turnpike Troubadours, Ryan Adams, Old Crow Medicine Show, and Whiskeytown. Enormous fun, and something which will hopefully happen again at a future show. We closed out the Sunday evening with a final jam, this time joined by Ryan Saunders on vocals. Whenever I go to a show I always keep my eye peeled for a tool to add to my tool chest to commemorate the show. My only requirements are that it must be useful, and something which I wouldn’t be able to just order or pick up in the normal course of events. EWS must have had a boxwood smoother vibe going on, because I ended up bringing home two boxwood smoothing planes. The first is a minature boxwood smoother made for me by my good friend (and father of the Nut Saver) Bern Billsberry – Bern had mentioned last December that he was going to make a run of these and I asked to be put on the waiting list. On the Saturday morning he presented me with No.1 of this run of planes. This plane is not just a curiou – as well as being tiny, it works really well and will be invaluable for shaping guitar braces. My second plane of the weekend came when I was visiting Oliver Sparks‘ stand before the show opened (a dangerous move, I know). I have admired Oliver’s work since we met at EWS 2015, and he and Molly are just the best people. While looking over Oliver’s stock of gorgeous planes, I came across a gorgeous boxwood thumbplane with new old stock iron. I have a real weakness for thumbplanes and this was at a very keen price point, so I snapped it up without hestitation. The plane works as well as it looks, with incredibly crisp craftsmanship (there is a reason Oliver is one of the leading lights of British plane making) and I’m sure it will be a mainstay of my tool chest for many years. See the look in my eyes? That’s the look of a man about to buy a boutique plane. But as wonderful as the tools were, the real joy of Handworks was the sense of community, friendship, and a shared enthusiasm for the craft (and the jam session, obviously!). Shows like this always offer new (and unexpected) opportunities, and I’ll be posting more as events unfold. A final word of thanks must go to the Over the Wireless Street Team – those dedicated souls who wore OtW tees over the weekend. Anne, Doug, and Bern (and of course Dr Moss, Dad, and the Apprentice), I salute you. With Megan and Anne – the American contingent was out in force this year! The following is adapted fom my article about Handworks originally published in Furniture & Cabinetmaking Issue 261. At first, Amana Colonies, Iowa, may seem like a strange holiday destination, and yet for many woodworkers it was precisely the dream location to visit during late May this year. The reason? Handworks 2017. Organised by bench hardware manufacturers Benchcrafted, Handworks is a two day long, bi-annual show drawing together many notable tool manufacturers, craftspeople, and publishers. As a result the show is an undisputed highlight of the woodwork calendar, and draws attendees from North America, Europe, and Australia. What is more, unlike most other woodwork shows Handworks is purely hand tool orientated – the mission statement is simply: “ask the makers about their tools and lean first hand how hand tools make woodworking mow precise, easier, more enjoyable, and more meaningful”. Handworks 2017 promised to be the biggest instalment yet, featuring over fifty stalls spread across five barns as well as a Saturday morning presentation by patron saint of hand tool woodworkers Roy Underhill. “So, what was Handworks like?” asked a woodworking friend a few days after the event. In a word, inspirational. The sheer range of demonstrations, tools on display, and makers to meet, was incredible and the two days flew by. It would be impossible to give an account of all of the tool manufacturers, makers, and demonstrators who had stands across the five barns (for that visit www.handworks.co). But what was instantly noticeable was that despite being billed as a woodwork show, Handworks was in truth a coming together of a variety of related crafts, covering woodwork, tool makers, textile and leatherworkers, and blacksmiths. Mary May has a better business card holder than anyone. Fact. The wide variety of woodcrafts represented at the show was outstanding, including carving by Mary May, period furniture making, green woodworking by Don Weber and chair making by George Sawyer, Peter Galbert and Caleb James, to name just a few. Blacksmiths were well represented by Peter Ross, Seth Gould, and Blackbear Forge, while Texas Heritage and Camp Robber both displayed an extensive range of workshop aprons and tool rolls. A personal highlight was trying out a Roorkee chair made by good friend Anne Briggs using sublime leatherwork by Texas Heritage. Texas Heritage sell the complete leatherwork for Roorkee chairs and camp stools, and seeing the finished article in person has bumped this project to near the top of my to-do list! Publishers and writers were also out in force, with Mortise and Tenon, and Lost Art Press stands both proving to be very popular, the latter hosting a number of their authors for book signings throughout the duration of the show. Of course, you cannot talk about Handworks without talking about the tools. No matter what your preference, Handworks had something to tempt the wallet and push airport luggage allowances to the limit. As well as the wealth of vintage tools sold by Patrick Leach, there were many modern tool manufacturers demonstrating their wares and answering questions. For many woodworkers, shows like Handworks offer a rare opportunity to see tools by smaller manufacturers in person, and to use infill planes by Konrad Sauer, wooden planes by Scott Meek, or marking gauges by Hamilton Woodworks. Other highlights included shaving horses and workbenches by Plate 11 Workbench Co, an opportunity to test drive the new Bad Axe Tool Works frame saw, and marvelling at the sheer beauty and precision of Vesper Tools’ in-filled marking and layout tools. Handworks has traditionally been an opportunity for tool manufacturers to unveil brand new products, and this year was no exception. Texas Heritage presented their new “saddlebag” tool organiser – perfect for hanging in a tool chest or above a workbench, while Blue Spruce Toolworks debuted a brand new coping saw design. One of the biggest product announcements of the show was a combination plane by Veritas modelled on the now-discontinued Stanley No.45, which attracted a constant crowd eager to give it a test drive. The Bad Axe frame saw is the most fun you can have with a saw plate. One of the highlights of Handworks 2015 was a rare public showing of the iconic tool chest of H.O Studley, alongside which Don Williams had given a series of presentations about the tool chest and his book on the same subject, “Virtuoso” (Lost Art Press). The Studley tool chest, and “Virtuoso”, clearly had a significant impact on at least one woodworker, as Handworks 2017 featured a complete reproduction of the Studley tool chest made by hobbiest woodworker, and surgeon, Jim Moone. Jim estimates that the chest took him six months to make alongside his medical practice, including modifying tools to match the contents of the original chest. Jim’s reproduction is breathtaking in its detail and commitment to authenticity, and completing such an ambitious project is impressive in itself even without taking into account the brief time span of the project! Community has been a constant thread in my writing over the past couple of years. The overwhelming atmosphere at Handworks, and the buzzword on everyone’s lips, was community. The tools were shiny and plentiful, and the demonstrations were fascinating. But what was truly special about this event was watching people who had never met in person before come together over a shared love of handwork, a passion for preserving traditions and crafts, and for making things. It was of course an opportunity to turn online connections made through the vibrant community on Instagram, and blogs, into real faces and friendships, and throughout the event there was countless moments when people would introduce themselves using their Instagram handles and then follow up with their real names. For two days, over antique tools, the latest products from modern tool manufacturers, or traditional German food, knowledge was shared, friendships forged, and contact details exchanged. This was the true magic of Handworks, and for many (including myself) the reason why they attended. Jim Tolpin and George Walker demonstrating artisan geometry. While I doubt any attendee managed to leave without buying at least one new tool or book, it is certain that no one left without a sense of having found an inclusive, supportive, and welcoming community bound together by the woodcrafts. Where else could you find yourself sitting next to George Walker and Jim Tolpin over breakfast, or strum a handmade resonator guitar by Mule Resonators over pizza in the evening? 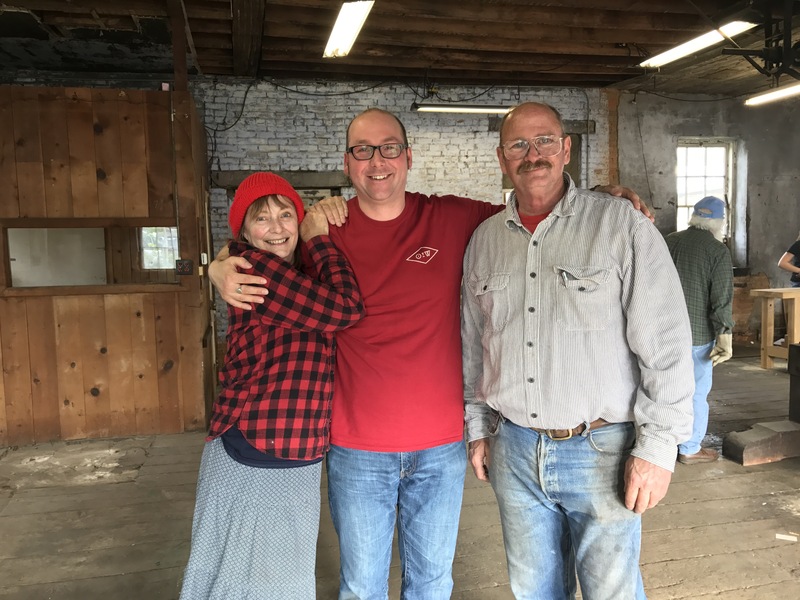 But what was truly special about Handworks was witnessing just how welcoming everyone was, and I am sure that this strength of community will give real comfort to anyone concerned about the future of hand tool woodwork. Tool chest by Chris Schwarz and Jameel Abraham. Handworks ended with plenty of warm farewells, promises to stay in touch, and carrying away bags overflowing with new tools and books. Hundreds of people attended, and hundreds of different stories will be told. But winding through all of those stories, is the thread of a community brought together through a love of handwork and the joy of sharing that passion with other makers. Organising Handworks is a massive endeavour, and there is no guarantee that it will take place again. If Handworks 2017 is the final show then it will be a fitting end, but I for one certainly hope that there will be a reason to visit Amana in 2019. And just like that, Handworks 2017 is over, and I’m back in the UK feeling quite jetlagged. After nearly 12 months of build up, the event itself flew by at breakneck speed. Given that the show covered five separate buildings and featured over 50 demonstrators, it would be nigh on impossible to give an exhaustive account of the show (not to mention that I covered the event for Furniture & Cabinet Making so need to attempt that herculean task for the magazine). Needless to say, the tools were shiny, especially Konrad’s planes, which I finally got to try for the first time, and the Studley reproduction was eye-wateringly beautiful. Seeing new tools unveiled by Veritas, Blue Soruce Tool Works, and Texas Heritage, and a sneak preview at something else which has not yet been publically announced, was very cool. But what really struck me throughout the two days, and what I had flown out for, was the sense of community. I’ve known Chris (of Sterling Tool Works) for 3 years, but Handworks was the very first time we met in person. Many thanks to Chris for letting me hang out on his stall and sell OtW tees. I’m only one participant, and I am looking forward to reading other accounts of the event over the coming days to see how others experienced the event. But for me the real highlight was the warmth, friendship, cameraderie, and inspiration demonstrated by everyone I spoke to. I’ve written a lot about community in the past two years, but nothing had prepared me for the experience of meeting so many good friends in person for the first time, for seeing plenty of old friends again, or for the generosity of spirit in action. Thank you to everyone who stopped by to say hello and introduce themselves. Jason Thigpen (of Texas Heritage) is another longstanding friend I’ve been waiting years to finally meet. He has a strong line in headgear. Events like these always result in opportunities that wouldn’t otherwise present themselves. On Friday I gave an impromptu talk on selecting backsaws at the Bad Axe Tool Works stand thanks to a very kind invitation from Mark, and that night got to play an incredible resonator guitar by Mule Resonators over beer (one of Matt’s guitars needs to become a permanent fixture in my life). Chatting to Megan resulted in a possible article for Popular Woodworking next year, and I have also started to knit together the strands of an ambitious article which I hope will consolidate and expand upon some of the themes I’ve been writing about for the past four years, and which is set to feature contributions from some significant craftspeople – more on this as it starts to come together. A personal highlight was Jameel Abraham of Benchcrafted (who by the way is the nicest guy imagineable) asking me to put some OtW decals on the sublime tool chest he built with Chris for PopWood last year. And where else but Handworks can you turn around at breakfast to find Jim Tolpin and George Walker standing behind you in the coffee queue? Jim McConnell is my favourite woodwork blogger, and a good friend to boot. Beer was quaffed, yarns were spun, memories were made. Although it is bittersweet to leave Amana (for me at least – the Apprentice still has a beard phobia which meant that Handworks wasn’t the most comfortable time for her), the good memories and strength of community, will continue to inspire me in my ‘shop for months to come. Some of the same faces will be at the European Woodwork Show in September, and while another Handworks is never guaranteed, I am sure that future events will continue to bring us together. With Megan Fitpatrick, who is just as entertaining and erudite in person as in print. It was great to finally meet Nancy Hiller after months of chatting on Instagram. Mark Harrell is a dangerous man – everytime he makes a new product money disappears from my bank account. Top chap. I’ve known Anne (of All Trades) for years, but this was the first opportunity we’ve had to catch up in person. Great times. Does the Kilted Woodworker need any introductions? Ethan is one of the most generous and community minded people I know. This guy definitely doesn’t need any introduction. But he’s been a damn fine friend and mentor over the past 3 years. With Vic Tesolin. There’s a 98% chance that Vic cracked an offensive joke immediately before this photo was taken, during it, or straight after. I wouldn’t change that for the world. Jameel Abraham of Benchcrafted – the nicest guy. Thanks to him Handworks happens. Konrad Sauer and I first spoke when I was researching the Karl Holtey article for PopWood. His planes are sublime. John and Janet Switzerland – the loveliest people you could hope to meet, and great craftspeople to boot. With Jenny Bower (who I interviewed for Furniture & Cabinet Making a couple of months ago) and husband Nathan. The Baby Anarchist’s Tool Chest built by Chris and Jameel, now sporting OtW decals.